The items on this page are ONLY sold exclusively on this website! Saturn V/Apollo Lunar Orbit Rendezvous is a reprint of a rare document from the early 1960s in which the whole Apollo moon landing mission was presented and illustrated. 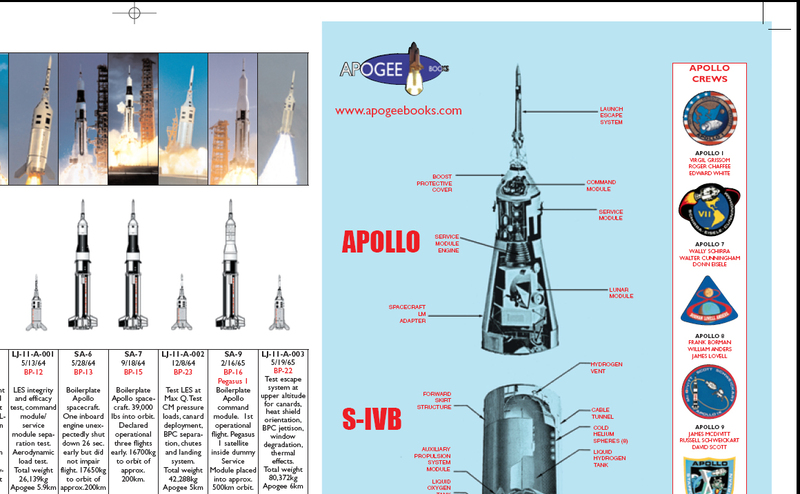 The book includes a large fold-out of the Apollo mission as well as a fold-out of the Saturn V moon rocket. 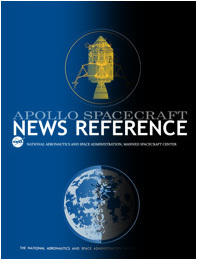 It includes illustrations of early iterations of the Lunar Module, maps of the Cape Canaveral launch sites, launch schedules for all of the Apollo test flights, detailed specifications and schematics of the Saturn V launch vehicle stages, construction schedules, engine summaries, information on the VAB, mobile crawlers, Umbilical towers, and more. 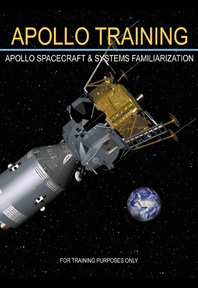 The second book, Lunar Module Familiarization Guide is a combination of several documents which include detailed diagrams of the interior of the final flight model of the Lunar Module, the instrumentation, a fold-out of the instrument panels, maps and plan views of the vehicle, diagrams of the main onboard systems, 2 DVDs and more! 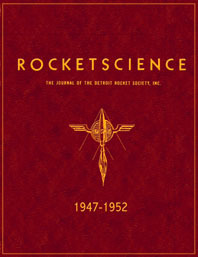 The Journal of the Detroit Rocket Society is an obscure rarity of rocket history which has never been reprinted for over 50 years, until now, thanks to Alfred Zaehringer, who over sixty years (!) later is still actively pushing space flight. This book will only be produced in extremely limited quantities. It is 81/2 by 11 inches and 552 pages of photo facsimiles of every edition of the Journal from 1947-1952. It features unique material by Krafft Ehricke, Hermann Oberth, Eugen Sanger, Heinz Koelle and more. Exclusive! 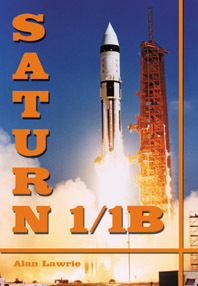 This special package includes Alan Lawrie's book, FIVE COMPLETE DVDs of NASA films about the preparation and production of the amazing Saturn I and IB rockets and a bonus book of the rare Saturn IB News Reference Manual. Exclusive Around the World in 84 Days Signed hardback edition. Authentic Autographed item signed by Skylab Commander Jerry Carr! This book recounts not only the story of the pioneering mission of Skylab 4 but also the personal achievements of its commander both before entering the astronaut programme and after leaving it . With the full assistance of Jerry Carr, his family and colleagues his very special journey can be shared not only aboard Skylab but in life before and after a spaceflight. Comes with a special bonus book and unique DVD. 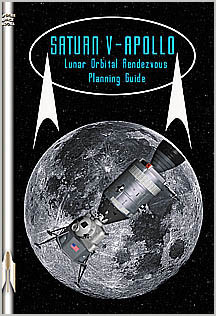 The Apollo Advanced Lunar Exploration Planning book for only $16.95. The Apollo Advanced Lunar Exploration Planning book is only available through this special offer. 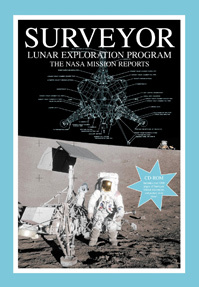 This 96 page book was one of the principal resources used in the creation of the Lunar Exploration Scrapbook. This rare NASA template from 1967 investigates the details of the various advanced Apollo studies conducted by NASA in the late 1960's. Get this excellent resource for only $16.95 plus shipping. This 168 page book was originally compiled for astronauts and NASA internal staff in 1968. It includes 166 pages of diagrams of Apollo systems, trajectories and basic procedural information. This extremely rare black and white collectible with a full color cover is now available in its entirety for the first time since 1968. Extremely limited print run, perfect Christmas gift for the space history buff in your family. This short, but critically important program consumed $426 million of NASA’s budget in just two years but it not only proved the worthiness of new hardware, such as the hydrogen-propelled Centaur booster stage, but also that of the robust and ingenious Surveyor probes. 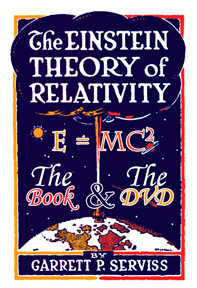 For most of the last hundred years Einstein’s Theory of Relativity has symbolized the pinnacle of human conception. Thanks mostly to a journalist who couldn’t be bothered to investigate his story; most people were led to believe that the famous theory was only comprehensible to a handful of brilliant physicists. Nothing could be further from the truth, but back when this book was written this intimidating baggage had already been placed aboard Einstein’s wagon. The author, Garrett Putnam Serviss, was a popularizer of science and astronomy for the Hearst newspaper group. He wrote many excellent books and magazine articles and so, as you will see in Fadman’s introduction, he was the obvious choice to put together this companion piece for the proposed movie of the same name. 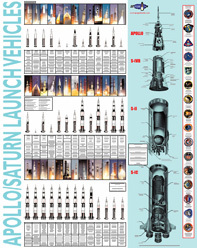 Spectacular and detailed new poster showing ALL 39 Apollo/Saturn launches in both diagram and photograph. Many of these launches have long been forgotten but this poster portrays the early era of the Apollo test program right on through to its spectacular conclusion with the joint US/USSR Apollo/Soyuz mission. Did you know that there were 39 Apollo/Saturn launches? This poster tells you launch dates, payloads, apogees, orbital altitudes and other significant details about the flights. From the smallest and humble Launch Escape Pad Aborts all the way through to the gigantic Skylab/Saturn V payload, this poster chronicles the entire evolution of the Apollo test and flight program from 1963 through to 1975. Every single launch is shown IN COLOR. Some of these color pictures cannot be found even on the Internet! Also an almost two foot tall rendering of the mighty Saturn V showing details of the vehicle, accompanied by thrust numbers, measurements and maximum achieved throw weights. Finally the crew names and mission patches for every manned Apollo mission are arrayed down the side of this spectacular and beautifully detailed poster. 24" by 19" on heavy 80 pound stock. This one just cries out to be framed! Click on item #154 in the shopping cart to buy this poster. The Ultra Rare and Coveted Apollo News Reference Manuals. These books have become legendary amongst the space collecting fraternity and have been known to sell at auction for as much as $6,000 for the pair. Now as a valued customer Apogee is proud to offer these beautiful replicas to add to your collection of Apogee Space Books. Each book comes with an accurate replica of the original 1960's cover and the pages are set out in the same sequence as the originals. Almost 500 pages of in depth detail about the Apollo spacecraft in the exact words of the contractors who built them. Only sold as a pair for $60.00 US. 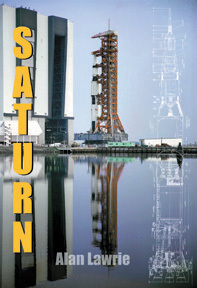 Worldwide exclusive to this website, a very special individually numbered and limited, signed edition of our recent Saturn V Book by Alan Lawrie. 45+ Members of the Wernher von Braun Huntsville Rocket Team including surviving members of the Peenem?nde Team, the builders of the V2 Rocket. Signatories include Konrad Dannenberg, Ernst Stuehlinger, and Charles Lundquist. Funds from the sale of these books will go to the Saturn V restoration fund at the US Space & Rocket Center in Huntsville Alabama. Did you know that when H G Wells masterpiece War Of The Worlds was first released it was serialized in several of William Randolph Hearst's newspapers around the USA? 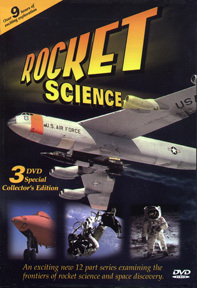 The series was so successful that Hearst immediately commissioned his own science writer Garrett P Serviss to create a sequel to run consecutively after "Worlds" concluded. 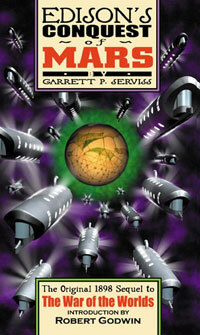 Edison's Conquest Of Mars became the world's first techno thriller with all manner of firsts included in the story. In his memoirs rocket genius Robert Goddard talks of the books influence on him as a boy, inspiring him to dream of traveling to the stars. Rocket Science takes an inspired look at the history of space exploration. 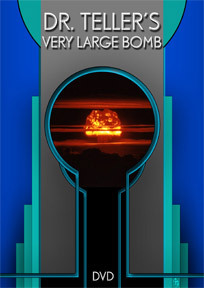 Through personal interviews, never-before-seen film footage, and classified tours of top-secret facilities. Rocket Science investigates the most exciting moments in the race to reach space. Some of science's most significant breakthroughs are highlighted... everything from building the first rockets, to Chuck Yeager breaking the sound barrier and Neil Armstrong landing on the moon. Colorful commentary and personal anecdotes from the people who influenced and shaped space flight add a captivating element of human drama to this unique series. Just a few of the exclusive interviews include: Walter Cronkite, Chuck Yeager, Scott Crossfield, James Lovell, Frank Borman, Gene Cernan, Wally Schirra and Gene Krantz.